After Patrick 'Iregption' Tardif's eventful weekend at the Poker Playground, we were able to sit down and have a chat and talk about his overall performance this weekend and how he feels coming off of a nice win. I could very confidently say it was a success. 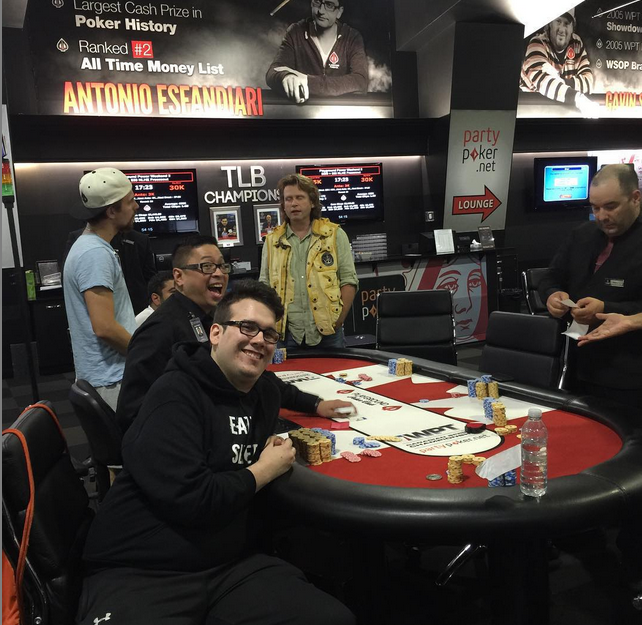 Any time you end profitable during a poker series is a good time. The Power Weekend was structured very well and I enjoyed every moment I was there. Just like my other two times I’ve played at the Playground Poker Club, it’s professional and exciting. I personally do my best to chat up the table and make the experience enjoyable for everyone else as well. Too often you have the people with sunglasses and headphones who don’t interact at all with the table. Especially when it’s the pros’, it’s just a horrible representation for poker. I want to see myself as an ambassador, and as such I should do my best to improve recreational players’ experience. Besides that complete tangent thought, winning my first live tournament was awesome. I had yet to experience such an event, and look forward to doing it again. It’s pretty neat when your wallet can’t close. The cash ($4703) is my biggest tournament score to date, live or online. I’ve got a new high score to beat. 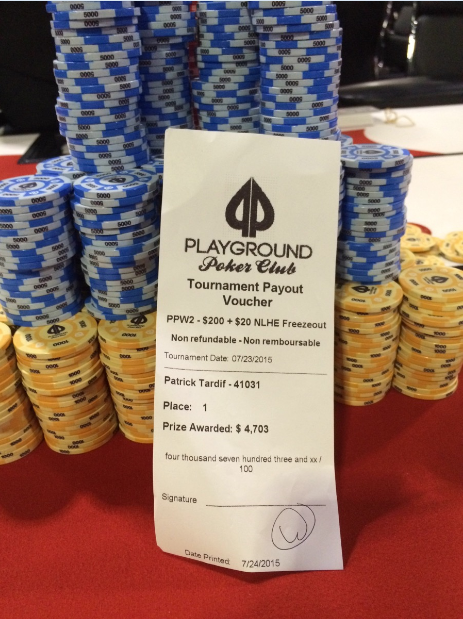 What is the biggest thing you can take from this weekend at Playground Poker Club? Patience… It’s incredibly easy to get caught up in all the players limping and wanting to play hands you would never play online. It’s a weird feeling that’s not really quantifiable until you sort of experience it. Maintaining composure and treating every hand like it was my last really helped me play my best. What was the most memorable thing from this weekend, and why? There were a few hands that were very key to my victory. The first I had around a 55,000 chip stack at 1000/2000 blinds. A regular went all in under the gun (first to act) for 15,700 and it was folded to me on the button. I had King nine of spades, and opted to call. I felt like I was way ahead of his range and was ok to flip for 7 big blinds. Then the small blind jammed for around 25,000 totals. Big blind folded and I was forced to call the small blind. After the hands were tabled my king nine was verse under the gun’s queen 10 suited and small blinds pocket eights. The flop came king two two, turn 7 and river 4 to give me the massive pot and propel me into a top stack. The next most memorable hand would definitely be the last hand before the final table. It was 10000/20000 blind levels, and we were at 12 players remaining. Under the gun had jammed for 315,000 total and small blind then also went all in for around 50,000 totals. My stack size was around 380,000. I looked down at ace queen of hearts. I thought for about one minute before I decided to call. The under the gun player had pocket nines, and the small blind had pocket sevens. This was incredibly ideal for me; as my hand was very strong verse theirs. The flop then came Ace ten eight all spades. Typically when I hit a pair, it usually means I have around 85-90% chance to win the hand. However, since both players had a spade, there were additional outs that could give them the win besides a 9 or a 7. Fortunately, the turn and river bricked (missed them) and I held and scooped the huge pot. It made me chip leader of the final table. Personally speaking how does it feel for all this hard work to pay off? It’s sort of hard to quantify. Some of it is relief. Putting in as many hours as I have you can get a little self-conscience about the whole situation. When you don’t get big results you begin to question yourself and your abilities. While it’s hard not to think results-oriented, confidence can be an issue. The win gave me the affirmation I may or may not have needed. Some of it is excitement. With big wins opens up bigger opportunities. I now have the potential to keep moving up the poker ladder, and more-so even quicker. Finally, I’d have to say it’s reassuring. Like I said about confidence, it’s nice to know after a large enough sample size you can be winner if you continually make the positive expected value decisions. Overall it’s just awesome. Right now, probably just relaxing, and figuring out some occupation decisions. I plan on trying to teach English in Asia, so I’ll be trying to have that figured out as soon as possible. As well, I might be returning to Montreal next month for their Montreal Expo festival. More live poker might be in the future! best rated essay service Wend over is a huge purpose for blackjack. One of the merely seats in the earth where the entire town is solitary deck apart from for a solitary $2 twice deck pastime at the Red Garter.